How many of you watched the Super Bowl last night? Thankfully I liked both teams, so was on team "All Time QB". I remember "back in the day" when we would watch the Super Bowl JUST for the commercials. I mean if these companies were dropping that much money to get a 30 second spot on TV, they BETTER be good, right?! I would say there were only two commercials that stood out to me last night (maybe I wasn't paying that close of attention this year, or maybe they really just weren't that great). The first was the Loctite commercial. Um.... can you say HILARIOUS?! Now obviously I am not running out to buy super glue any time soon, but I still give them BIG PROPS for making me chuckle! I mean who doesn't love a good fanny pack?! #AmIRightOrAmIRight?! The next one was an Always [Yes, the feminine hygiene period pad company...] commercial that resonated with my heart. REAL TALK: I would say I definitely grew up with terrible self esteem. And if I was completely honest with myself (and you), I would say it is the same today. I grew up thinking I was "too fat", "too stupid", "too flat chested", "too ugly", you name it I hated it about myself. The unfortunate thing is, I don't think I was/ am alone. I think society imposes all kinds of crazy expectations on us (not just girls, but for some reason it seems as though we are more impressionable) and we are continually battered down and down. Any self love we may have had at one point (the commercial says that it tends to happen around puberty), quickly turns into self hatred. Last night I noticed my Instagram feed had a bunch of pictures of women doing things #LikeAGirl. It was so empowering to see ladies CLAIMING the phrase! It wasn't something to be ashamed of, it was something to OWN! I jumped in and posted a picture of me "running like a girl". 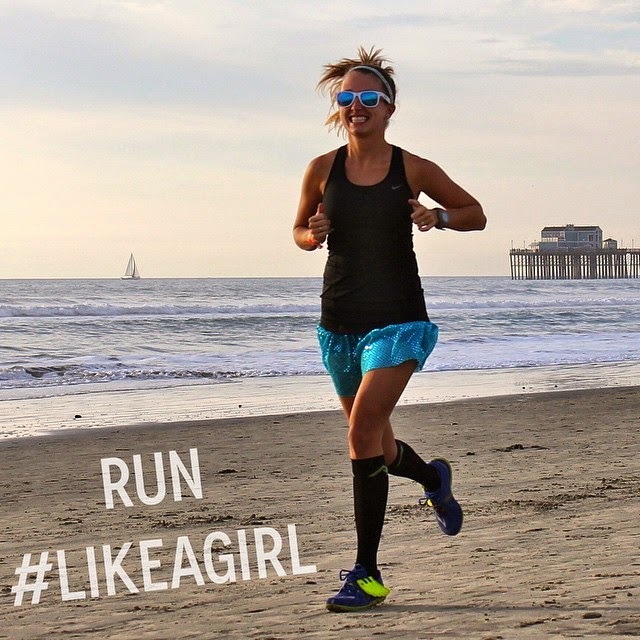 I posted it with a comment that said: "Proud to RUN #LikeAGirl! Strong, sparkly, and speedy!". But then I got to thinking today, am I proud of who I am? Do I love myself? How is my self confidence? I think that is one of the reason I try to be as encouraging to others as I can be - because I know what it feels like to hate yourself and think no one is in your corner. I would never wish that upon my worst enemy, so if there is anything I can do to try and prevent others from feeling that way, I will do my darndest! Honestly, I think running has helped my self esteem a bit. Instead of seeing my body as something to be ogled (which is what society tells us it's for, right? ), I started seeing it for what it could DO, what I can accomplish. Instead of seeing my thunder thighs as being fat, I have started seeing them as strong to help me conquer hills. I am not saying that it changed overnight, but eventually it can help. I mean, if you think of yourself one way for 25+ years, you aren't going to be able to change that opinion overnight... Running is great, but it isn't a magic pill. Sorry for the rambling and jumping all over the place - just trying to keep it real. As you can see, my self esteem is still a daily struggle (last week was extra craptastic with it), but I felt it was important to address, especially in light of the #LikeAGirl campaign. How is your self confidence? For sure. My self esteem isn't where it can be. Also, growing up being told that "wow you hit hard for a girl!" is very frustrating. I still get that today actually. The reclaiming of the phrase is a pretty big step forward for younger girls as they nagivate through growing up and will now be associating "like a girl" as a positive instead of negative thing! I think that we all go through a period where we have to make a decision that we are, indeed, enough. Running has helped with this immensely, but you are right, it isn't a magic pill. But it teaches us to love ourselves and treat our bodies with respect if we really want to accomplish anything. I would say that I struggled with self esteem growing up but as I've gotten older I've learned the love the body that I'm in and love myself more. I don't know what happened to me, but my confidence has increased a lot in the past year. I just don't have the energy anymore to obsess about looking and acting perfect. It has been such a weight off my shoulders. The one challenge is trying to battle the everyday negative influencers around me i.e. media and a few friends/family members who are still fixated on perfection. Yep. This is my life's struggle. After spending my entire life being shamed, ridiculed, harassed, etc. for the size of my body, it was pretty impossible for me to develop any semblance of self-esteem. And now that I'm living life in a somewhat smaller body, I continue to battle the same issues. All I can do now is focus on my accomplishments, and when it comes to my body, I tend to look at my legs as "marathon" legs or "karate" legs instead of, say, "thunder thighs." It's a struggle, and it takes SO much time, but I do think we can all slowly but surely retrain ourselves to look at ourselves and our bodies in a positive way! I had found this add online last year actually - it is one of the best women fitness empowering commercials out there. It's real people, not awesomely strong female athletes. Get young girls involved in sports early, remind them to always feel how they felt in the sport at that time, hopefully will show more strong girls growing up fighting against the confidence bullies!